As discussed under section Stygnanthe, section Angustiflorae is newly described to account for the species that are slender herbs with narrow corolla tubes, and ones where the corolla lobes are proportionally longer relative to the corolla tube. 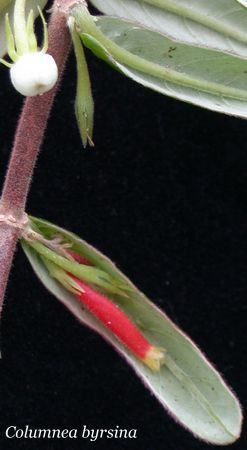 A species that characterizes this section is Columnea byrsina. This species has anisophyllous leaves as many species in this section do, but they do not reach the size of the leaves in section Collandra. 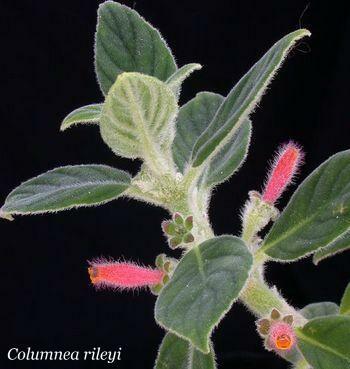 The corollas are relatively small compared to those in other sections and are not two-lipped, as they are in section Columnea. The slender stems and epiphytic habit round up the characteristics of this section. Columnea byrsina exhibits an unusual characteristic in the field. When exposed to full sun, the bright red flowers are easily visible adjacent to the leaves when the plant is viewed from above. However if cloud cover threatens rain, the flowers will be found hidden underneath the leaves. This has been observed in the field but to my knowledge, no experimentation has been done in cultivation to determine whether it is the leaves or the flowers that move, what the mechanism for the movement is, or even the intensity of sunlight needed to cause the movement.